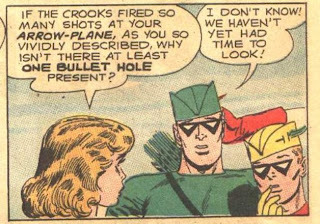 I wrote recently about the end of the Green Arrow feature in World's Finest. One of the tragedies in GA's demise was that a budding recurring character named Miss Arrowette went down the drain with him. And typically, she must screw up at some point, revealing that she's NOT QUITE READY. Art by the wonderful Lee Elias. 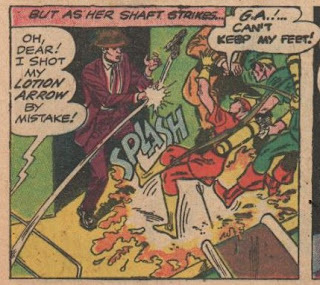 Predictably the man (GA) decided that the woman (Miss A) was not ready for crimefighting and equally predictably the woman agreed. 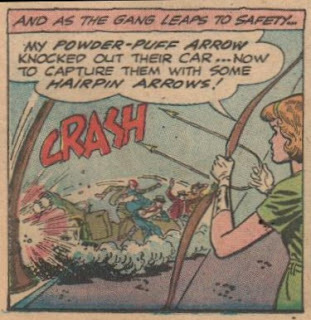 But the story held out hope for another adventure with Miss Arrowette, with Green Arrow remarking: "I can't help wondering, Speedy, if we've seen the last of this girl archer!" Note that in this story only, Bonnie is a blonde; in the other two she's a redhead. But we don't see much in the way of new arrows from her. 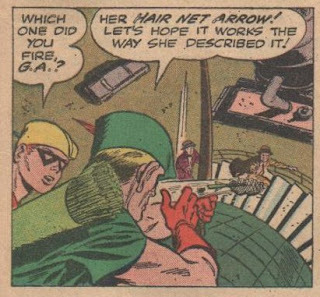 A mascara arrow performs the function of leaving a trail that the hair dye arrow did in the original story. 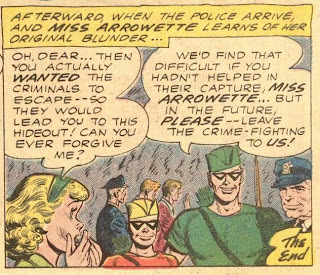 There were only three more Green Arrow stories left, so Miss Arrowette did not reappear (according to the GCD) for another 30+ years. We've talked a lot about the rebirth of old features in the Silver Age, like the Flash and Green Lantern, and of course Captain America, Namor and the Human Torch. But many, many features did not survive to the end of the Silver Age, and I wanted to touch on a couple of these. 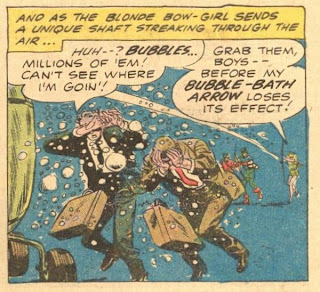 Green Arrow was one of the few superheroes to make it all the way from the 1940s to the 1960s. He had started out in More Fun #73, and by that issue's #77 began a run as the cover boy and lead feature. He was also included immediately in Leading Comics #1's feature, The Seven Soldiers of Victory, and added to the World's Finest lineup with #7. He was bumped out of More Fun after #107, when that title went more to a humor format, and the feature moved over (along with the new Superboy stories) to Adventure #103, where it replaced Starman. 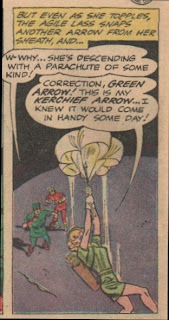 But after that, Green Arrow settled down for a very long time. Although he was not an original member of the Justice League of America, he was added to that cast with issue #4. Unfortunately, about the same time, he was dropped from Adventure comics after a 167-issue run. He did get to appear in the first superhero teamup in Brave & Bold, along with another doomed hero, the Martian Manhunter. 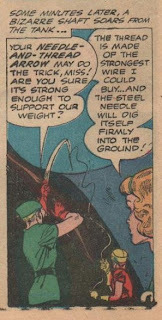 Green Arrow continued in World's Finest until #134, a 128-issue streak, then alternated with Aquaman for a few issues before DC decided to go with reprints behind the Batman/Superman teamups. 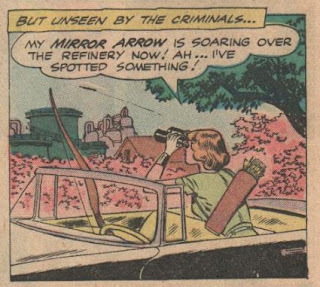 And with that, Green Arrow found himself with no regular feature for the first time in 23 years. Oh, he still had the appearances in the Justice League, but even those were irregular. Speedy, his longtime sidekick, eventually caught on with the Teen Titans, and that was essentially it for their relationship, as is well-documented. 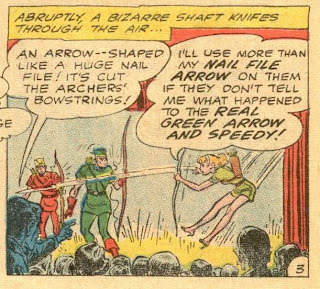 Of course, Green Arrow would change dramatically at the very end of the Silver Age; I have talked about that in the past. Roy Raymond initially appeared in Detective Comics #153, where he replaced Slam Bradley, which was at the time DC's longest running feature. Roy was a "TV Detective", with a show called Impossible But True that exposed frauds. Ironically, the name of the program was deceptive, since usually it turned out to be Impossible But Phony. 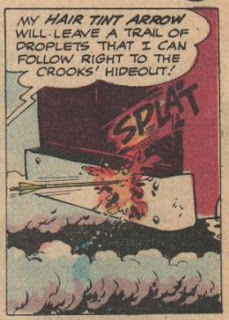 Roy Raymond lasted until Detective #292, when he was bumped to make way for Aquaman's brief run (7 issues) in 'Tec. Ant-Man was one of the earliest Marvel Superheroes, as I have discussed before. After a tryout in Tales to Astonish #27, Hank Pym returned in #35 for a fairly long run, both as Ant-Man and Giant Man. He held down the cover position until #59, when the Hulk joined TtA. However, effective with TtA #70, Giant Man was bumped in favor of Prince Namor, the Sub-Mariner.